1. Pick a nice, dark, cream polish and paint your nails. 2. Apply a matte top coat. I use one from NYC that works just fine. No need to purchase something fancy. 3. 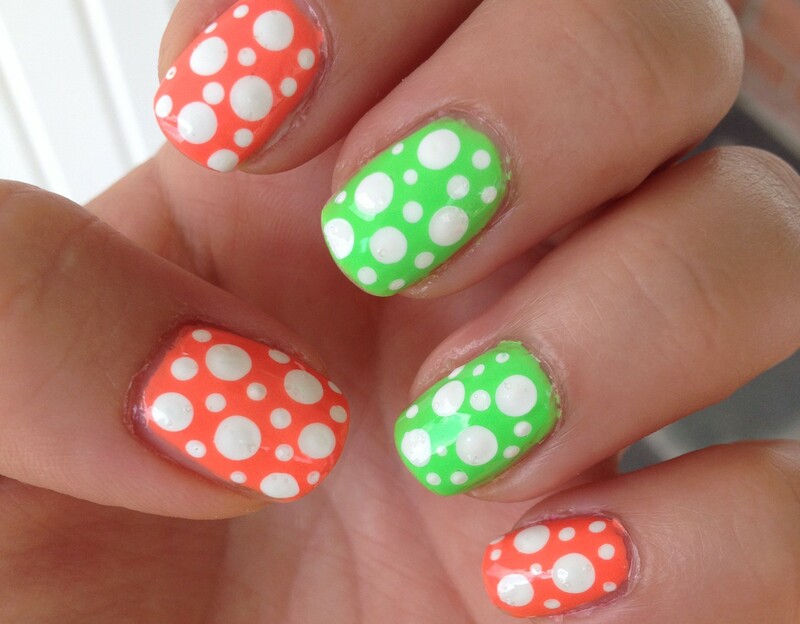 After your matte top coat is dry, add your dots or stripes or whatever to your nails with a clear polish. Please note: you don’t want to use a fast drying topcoat as your clear polish. It will dry up before you can complete your design and you’ll end up with a clumpy mess. Just plain, clear Wet n Wild polish or NYC polish (the $.99 kind) works perfectly. For the first look, I used Wet n Wild Megalast – Careful, It’s Vine-tage as my base. This polish was from their limited edition matte collection that came out last fall. Even though the polish was supposed to have a matte finish, it only looked semi-matte to me, so I put a matte top coat on it anyway. Then I took some various sized dotting tools and my $.99 clear polish and made some dots. That’s it! 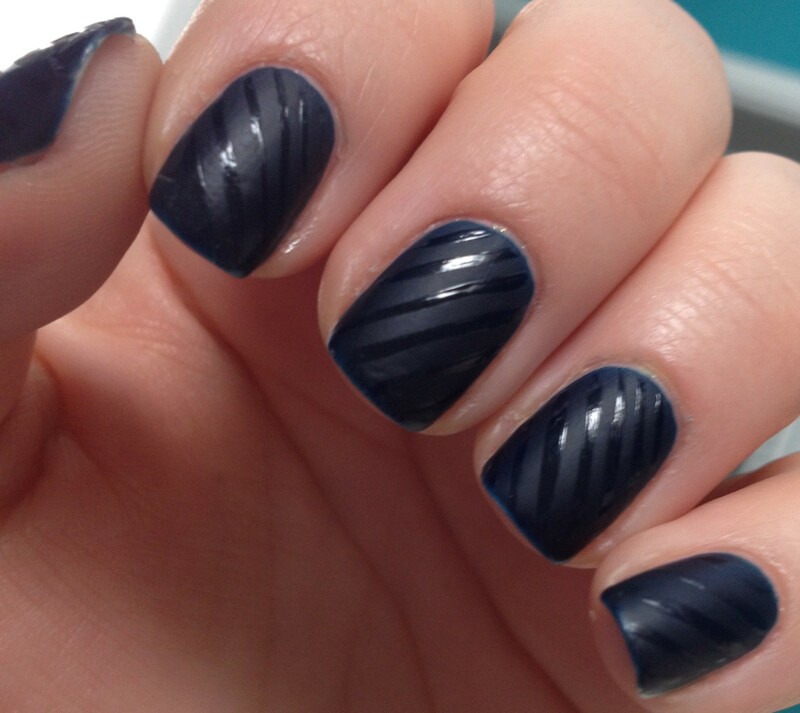 For my second look, I used Wet n Wild Megalast – Echo Dark, a navy polish from the same matte collection. This polish bums me out a little because it looks navy blue in the bottle, but on the nail it really looks black most of the time. Anyway, I applied a matte top coat, and then took my striping brush dipped in clear polish and made diagonal stripes on my nails. The first time I ever tried this technique was back in September and you can read about that here, if you so desire. I got way fancier with that design. For some reason, I always do glossy designs on a matte base, but you could always switch it around and do matte designs on a glossy base. Really, the possibilities are endless with this technique. Any animal prints would look really cool like this, or you could even do something as simple as a matte nails with just a glossy french tip! And since it works so well with dark colors, it’s perfect to do now before everything turns pastel and neon for the warmer months. Anyway, I hope you feel inspired to make yourself some beautiful nails! Thanks for reading! 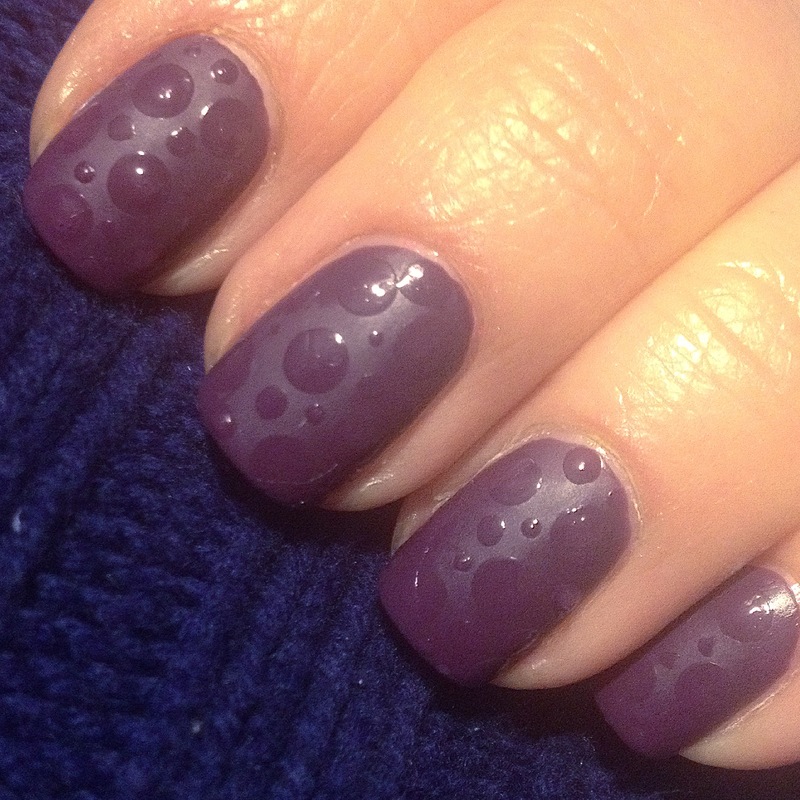 This entry was posted in Nail Tutorials and tagged matte nails, nail art, wet n wild. Bookmark the permalink. Thanks much, Jan, for explaining this matte dot technique as I thought it must be a 3-D technique since it looks that way. I wondered whether NYC polish went out of business since the line seems to have been removed from my local CVS store. Have you seen it recently where you used to buy it? I think I saw somewhere that it is (only?) sold at Walmart, now. Is that true, if you know? I’m not sure what is going on with NYC polishes. I do know that they were on clearance at Rite Aid, and the display at Target recently looks a little slim. My local Kmart still has a nice, full NYC display as of a few days ago.